Today, Amazon announced two additions to the Amazon Echo family: The Amazon Tap and the Echo Dot. The Amazon Tap is a smaller, portable device that is similar to the Echo, but with some big differences. The Tap is considered to be an Alexa enabled device. Alexa devices are always on. With the Tap, you must turn the device on to access the Alexa features. This feature is a bonus if you are someone (like me) that has privacy concerns and does not want an always on device. It is smaller that the Echo (6.2 inches to the Echo’s 9 inch height). Unlike the Echo, the Tap can connect to wi-fi hot spots using the Alexa app. While the original Echo was designed to be used at home, the lack of wi-fi connectivity for the had been a problem for some users trying to use it while traveling. 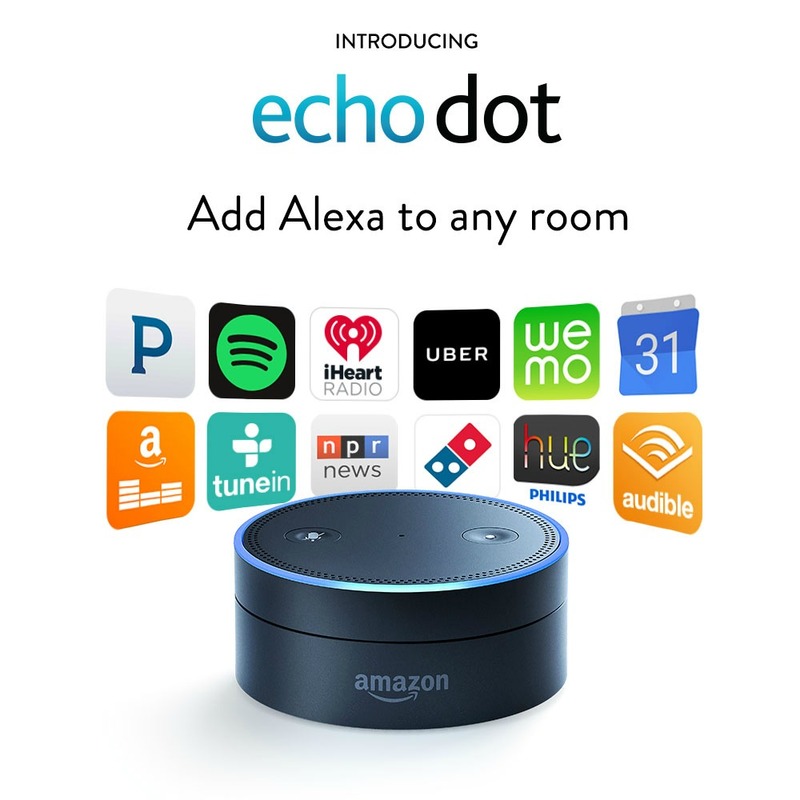 Like the Echo, the Tap requires the Alexa app for settings and connecting to the Internet or wi-fi networks. Since it is designed to be portable, the Amazon Tap comes with a specially designed charging cradle and retails for $129.99. The device will ship March 31, 2016. The optional sling is $19.99. You can find out more information or order the Tap here. The Echo Dot is currently available in limited quantities and is only being offered to Amazon Prime members. The item also can only be ordered through Alexa Voice Shopping. It can only be ordered through the Echo or the Amazon Fire TV. The dot is a small (1.5″ x 3.3″ x 3.3″) device that can be connected to other speakers, making its most obvious purpose the ability to add voice controls to “dumb” speakers . It is only being offered to to those already using the Alexa system, although it seems to have many of the same capabilities (playing music, controlling smart lights, etc.). It does have a small built in speakers. It is bluetooth capable, although not with systems which require a pin for pairing. Like the Echo, this device is must be plugged in and is designed for use with a home wi-fi system. The device retails for $89.99. You can read more about it here. I am seriously thinking about giving the Tap a try. I did notice in the video on Amazon that everyone seems to be picking the Tap up and using it like a microphone, while people always seem to talk to the Echo from across the room. I wonder if there is a difference in the microphone technology between the two devices? This entry was posted in Amazon Echo and tagged Amazon Echo, Amazon Tap, Echo Dot. Bookmark the permalink.